Joining Cathy with the wonderful In a Vase on Monday meme. Love-in-the-mist, Gardeners Garters and (learn to love your weeds) ground elder flowers. They are cosying-up in an old glass bottle that I found in the hedge of the farm cottage I lived in many years ago. Some of the materials in this piece of collage/embroidery are from that house and that time – the 1970s. Happy memories. This is how the piece looks now with some Swarovski crystals added and some more stitching. I’m just a tincey bit excited about adding crochet to embroidery and fabric collage – no that’s not true – I’m leaping about and squealing with excitement – can’t wait to see where this takes me. Thankfully, life is returning to somewhere near normal, a health scare in the family caused us all some anxiety for a while and daily rhythms went a bit haywire, but happily we are through to the other side and good health and well-being has returned. Sorry to be mysterious but as it was not my own health issue, I don’t feel I can say more. I have just spent a wonderful few days recharging my own batteries with creativity – that’s what works for me. Sleep doesn’t do it, but sewing, painting, crochet and being in my own creative space, exploring all manner of delicious possibilities does it every time. I’ve even started dreaming in stitches and colour combinations again! I feel like I’ve hit a Vein of Gold, long may it last. Do you ever feel plagued by ‘good’ ideas! I had Life Coaching a few years back with Duncan Coppock (brilliant by the way! If you give him a call, say hi from me – he put a part of my story in his book) and together we worked out questions I should ask myself when I am struck (yes that is how it feels) by a ‘good'(?) idea. ‘Do I really want to begin this project? How does it relate to my long-term goals? Do I have time to do it well? Am I ready to make this commitment? These questions have been up in my workroom for years – do I ask myself these questions ……. ever?! No!!!! I have now put them in a more prominent place, above the kettle in the kitchen – AND I need to add another question: Is this the most important thing to do today!!!! 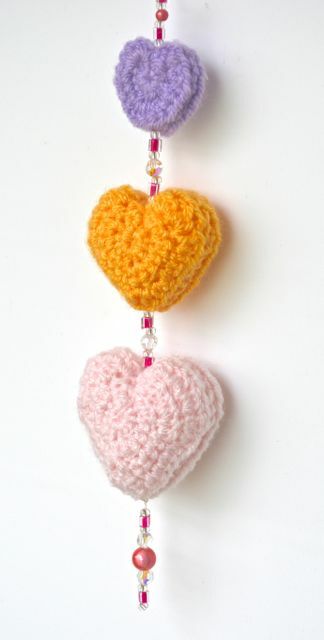 The hearts are the latest ‘good’ idea – I wanted to make one for each of my grandchildren for Valentine’s Day – What was I thinking – I have 8 grandchildren!!! and I only thought of it a few days ago. 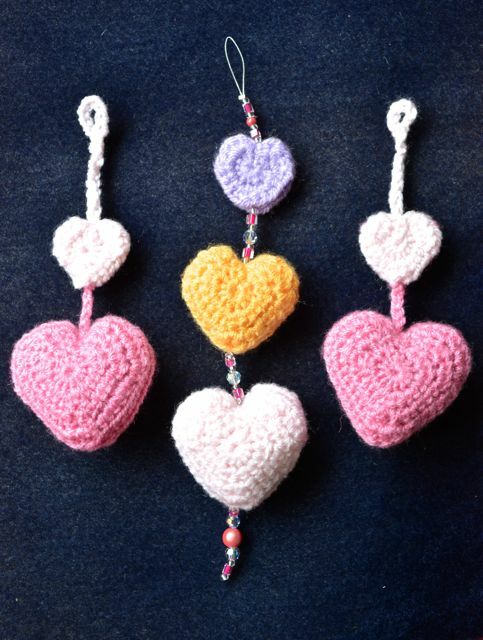 After spending far too much time experimenting to get these hearts right, time is running out – SO, for the Valentine’s Day, Big Sister and The Twins who live a 4 hour drive away will be getting these dingly dangly hearts. The eldest is 5, so she gets the one with the beads, the twins are only half past two, so no beads allowed. GARDEN DIARY The veg trugs just outside my front door were weeded, they are jam packed with self sown parsley and rocket, I graze as I go. And I found a few more snowdrops peeping up, I’m SO pleased to see them. They are a bit late but they are there, that’s the main thing. A few cyclamen and anemone blanda are in flower.